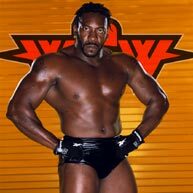 Booker T invaded a World Wrestling Federation Pay-Per-View at King of the Ring. Booker T shocked the crowd at the Continental Airlines Arena when he appeared during the main event and attacked Stone Cold Steve Austin. "It was crazy. It was great," Booker T told WCW.com immediately after the match. "The fans accepted me. It's something that you kind of worry about going from one place to another." The five-time WCW Champion had been idle for more than two months, since the last WCW Nitro aired. But clearly, he's remained in top shape. He was also clearly very happy to be back in the spotlight.